When he's not trying to advance self-driving car technology or explore space, Elon Musk likes to spend time working on progressing renewable energy, and he's been showing off two new products for the home in Los Angeles. 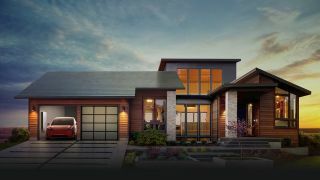 The first is made by SolarCity, one of many firms Musk has an interest in (he's currently trying to take it over with Tesla): solar roof panels that look like normal slates, are cheap to install and can power your home gadgets without costing the Earth. Musk's announcements were light on details (including costs and a launch date) but apparently a roof kitted out with these new tiles (of which there are several types) would save you money when compared with fitting a normal roof and having to pay for electricity separately. During the show, which you can see in full on Vimeo, we also got a look at Tesla's new Powerpack 2 battery for the home. These fridge-sized packs are designed to store all that power coming from the Sun and keep it available through the night and cloudy days. Each Powerwall 2 features two 14 kWh lithium-ion battery packs (double the capacity of the previous version) and is capable of holding enough electricity to power a standard four-bedroom house for an entire day. There's now a built-in inverter too for converting sunlight into electricity. The media event in California was as much about trying to sell the merger of Tesla and SolarCity as announcing new products but these tiles and batteries show the current state of progress in shifting the world to renewable energy, before it's too late to put the brakes on climate change.